It should come as no surprise to anyone who’s read this site for any length of time that I love me some LOLCats, beef jerky, pantless anything (insert things like writing, cooking, reading, crime fighting here) Deadbugs. I feel they’re one of the most underused and underutilized exercises out there, due in no small part to how innocuous they look. This is unfortunate because they offer a ton of benefits and have applicability to pretty much every person, athlete or non-athlete, injury-free or not. Not only are they a superb core training exercise, but their versatility in that they can be tweaked and progressed or regressed (depending on a person’s ability level) is what also lends them to MVP (or, MVE – Most Valuable Exercise) status in my book. Plain ol’ vanilla deadbugs – when done right (controlled cadence, movement comes from hips and shoulders and not lumbar spine, with a full exhale – are more than challenging for 90% of the population. I’ve had professional athletes and very strong individuals humbled by this “wimpy” looking exercise. To that point, I am never too quick to jump on the “lets make this exercise harder for the sake of making it harder” wagon. Because, frankly, more often than not…it’s not necessary. SIDE NOTE: this is why I’m amused at people who feel the need to up the ante on things like foam rolling. We now have people using foam rollers with spikes and bumps (some even vibrate) on them or even PVC and lead pipes, thinking they’re more effective. I’m half expecting rolling on a live grenade to be the next progression. It has to hurt in order to work. Who Did I Steal It From: Luka Hocevar of Vigor Ground Fitness and Performance. What Does It Do: Well, it’s a deadbug, so it’s already a killer anterior core exercise, and serves as a great way to teach someone to dissociate lumbar movement from hip movement. I.e., the idea is to maintain a neutral spine position and not allow the lower back to “fall” into extension as you move the extremities. 1. First, it’s important to “vet” individuals for this exercise. If they lack ample shoulder flexion to bring their arms overhead, it won’t be a good fit. 2. Holding the KB above makes it easier to engage anterior core (which will help to posteriorly tilt the pelvis, which is important for those people stuck in excessive APT). 3. 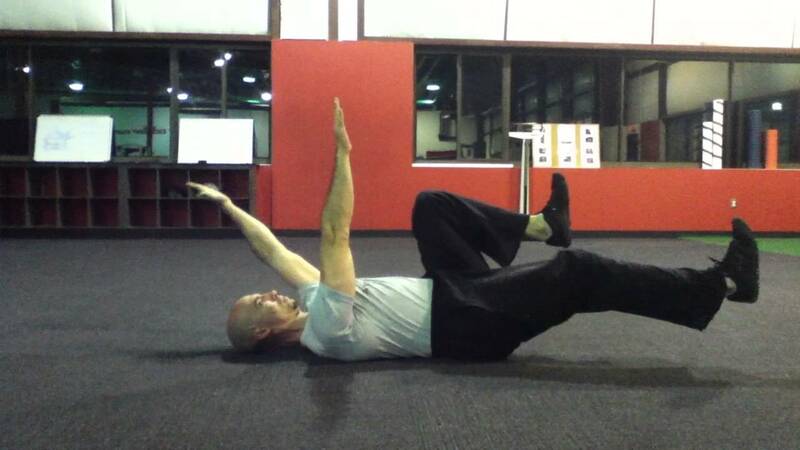 Lowering the KB (under control) cues the individual to create a flexion moment in the abdominals while simultaneously promoting an extension moment in the thoracic spine (where we want extension to occur). 4. Too, adding the “reach” at the end (where you keep the rib cage locked to the pelvis) is another fantastic way to increase more core demand and strength (and allow flexion, albeit with a teeny-tiny bit of load. Don’t worry, you’re spine will live). Key Coaching Cues: To reiterate above, go SLOW when lowering the KB. Own the movement, keep the ribs down. When it comes to the reach: try not to get movement from flexing the neck. Instead, “lead with your chest,” as if the chest were pushing the KB towards the ceiling. Hold for a 2-3s count, lower, switch legs, and repeat. 3-6 reps per side should be more than enough to respect the movement.